To celebrate the holidays, we are giving away a KitchenAid 5-Qt. Raspberry Ice Artisan Design Series Mixer with Glass Bowl! 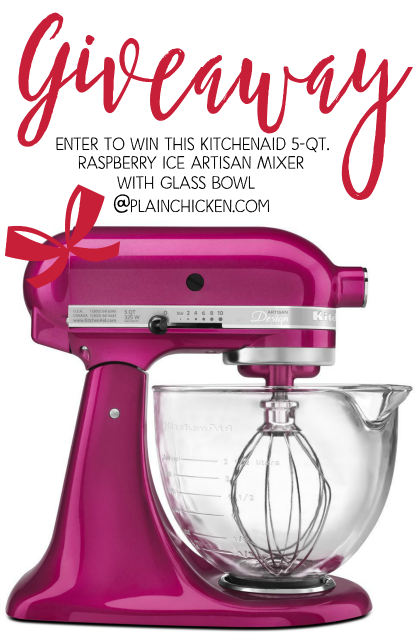 One lucky Plain Chicken reader will win this AWESOME mixer. I seriously can not live without mine! I also LOVE, LOVE, LOVE the glass bowl!!! There are lots of bonus entries to increase your chance of winning. You can like us on social media, subscribe to our newsletter and tweet daily about the giveaway for extra entries! The winner will be notified via email and has 48 hours to respond. If the winner does not respond in 48 hours, a new winner will be selected. Trying to win this for my sister!!! I have always dreamed of owning a mixer like this one. I'd love to win this for my future DIL. She takes after me and just loves to cook/bake and right now doesn't even have a hand mixer because hers burned up. She'd be thrilled with this for sure. Fingers crossed. Thank you for this amazing chance to possibly win. IS the competition open the Australian Residents? I would love to win this to give to my daughter. She is handicapped but loves to bake, she only has a small hand mixer and would love this one. I would love to win this for my son and daughter-in-law. They have had a rough year and I know this would thrill them! I just asked Santa for this but maybe I'll be lucky enough to be your lucky winner! My KitchenAid mixer was a wedding gift and it is 48 years old! I would love a new one! This is a wonderful giveaway! I have always wanted one of these mixers as I looove to cook, but sadly my budget doesn't have the room for it. That is calling my name !!!! Thanks for the opportunity to win. I've wanted one of these for years, but couldn't afford it. I would love to have this and bake more with my kids! So hoping for this! I have a very old, maybe 40 years or more, hand mixer and it struggles with anything very thick. This would make my year! What? this would be amazing to win!